Top Club at the 2014 Invitational Meet. Full Results available from the Woking website. The annual Hants & South Coast Invitational Junior Meet held at Woking on Saturday 18th January provided a great evening’s competition for young swimmers from across the region. Teams from Alton & District, Cranleigh, Farnham, Gosport, Hamble, Locks Heath, Staines, Wey Valley and hosts Woking competed across a range of individual and relay events. 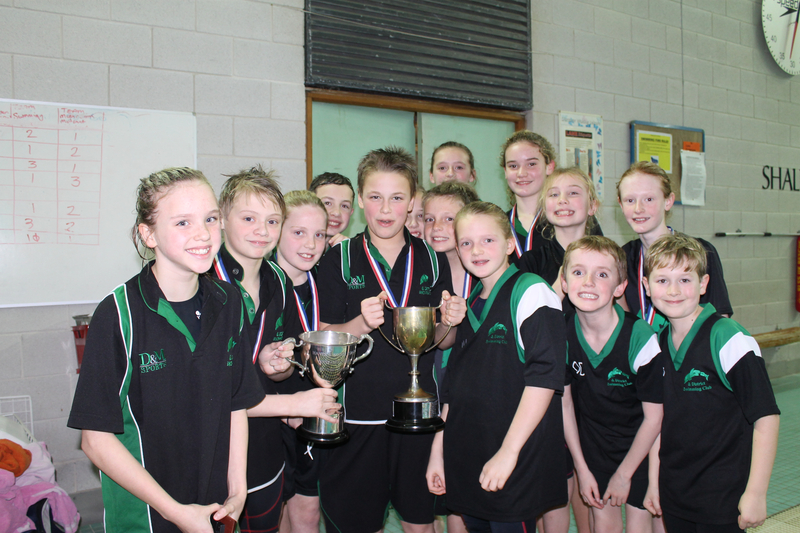 Organised into three age groups, Junior (Age 9), Intermediate (Age 10) and Senior (Age 11), there were medals and trophies to be won for individual performances and team placings, as well as overall Top Club. Locks Heath triumphed in the Junior category, Hamble Aquatics took the Intermediate title and Alton’s team of Katherine George, Olivia Murphy, Emily Rawlings, Lauren Swain, Rory Plewes, Will Port and Ben Williams were the Senior winners. Alton’s Age 9 team were second in their mini-league and the Age 10 team sixth and their contributions ensured that Alton finished as Top Club overall at the end of the competition. To cap off a great night for the club Rory won the award for Top Boy (Age 11) and he also took away a trophy for his victory in the 100m Individual Medley.